One of the fascinating things about reading historical fiction is seeing how differently things that we take for granted now were treated in the past. I found this passage interesting as it is set at the time of the Restoration to the English throne of Charles II, not long after the Commonwealth ended. During the Commonwealth, the celebrating of holy and feast days associated with the Catholic church was frowned upon, including Christmas. This passage comes from page 243 of Anthony Capella's The Empress of Ice Cream. Interesting passage, Marg. Something we take for granted as having always been in existence, and it hasn't. Not even close. from some of the religious historical books I have read (history of religion, I mean), seemed to think Dec 25 has an old source in early religions. It escaped them that kings had roles to play in deciding what we celebrate, too. I enjoyed reading this. Thanks! Marg ~ you realise Cromwell BANDED Christmas and had may Roman Catholics killed for their faith?! You can definitely learn some intersting things from historical fiction. I learnt a lot about the industral revolution in england from reading the barforth trilogy. I was so interested I did some research and it certaily seemed that the bulk of the content was accurate. Becky, It's one of the reasons why I love to read HF. Marshalslion, frowned upon might have been a bit of a tame word. Christmas itself was still recognised, you just couldn't celebrate it in the way that had become tradition (ie wassailing and feasting etc) and if you were found celebrating you were arrested. Susan, my understanding is that the dates for Christmas were set based on other pagan festivals that were in existence at the time. The quotes from this book gave me the chills, Marg. I can't imagine not being able to or not being encouraged to celebrate Christmas! I need to read this book! Zibilee, I really like most of Anthony Capella's books. 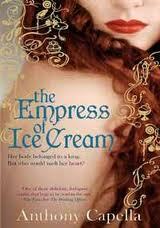 I do warn you, you will want to eat ice cream when you read this book!